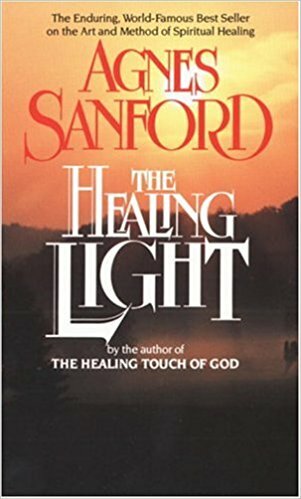 Excerpted from The Healing Light by Agnes Sanford. Copyright © 1947 by Agnes Sanford. Excerpted by permission of Ballantine Books, a division of Random House, Inc. All rights reserved. No part of this excerpt may be reproduced or reprinted without permission in writing from the publisher. HTML and web pages copyright © by SpiritSite.com. If we try turning on an electric iron and it does not work, we look to the wiring of the iron, the cord, or the house. We do not stand in dismay before the iron and cry, "Oh, electricity, please come into my iron and make it work!" We realize that while the whole world is full of that mysterious power we call electricity, only the amount that flows through the wiring of the iron will make the iron work for us. The same principle is true of the creative energy of God. The whole universe is full of it, but only the amount of it that flows through our own beings will work for us. We have tried often to make this creative power flow through us, saying, "Oh, God, please do this or that!" And He has not done this or that, so we have concluded that there is no use in prayer, because God, if there is such a Being, will do as He likes regardless of our wishes. In other words, we doubt the willingness or the ability of God to actually produce within our lives and bodies the results that we desire. We do not doubt our own ability to come into His presence and fill ourselves with Him, but His willingness to come into us and fill us with Himself. My baby had been ill for six weeks with abscessed ears. I prayed desperately that God would heal the child. My mind was filled with thoughts of fear and of bitterness, and these are not of God. God is love, and perfect love casts out fear. So God could not go through me to heal my baby, for there was a break in the pipeline that connected me with Him. Nevertheless, in His great kindness He did what He could for me. He sent me one of His own ministers. The minister was a young man, ruddy-faced, clear-eyed, full of normal, healthy interest in people and in life. "I'll go up and have a prayer with him," he said. "I don't think that will do any good," I replied wearily. 'He's only a year and a half old. He wouldn't understand." What I really thought was, "If God doesn't answer my prayers, why would He answer this minister's prayers?" "Oh, that won't matter," cried the minister, disregarding my feeble protests. He went upstairs. Light shone in his eyes. I looked at him and saw his joyfulness, and I believed. For joy is the heavenly "O.K." on the inner life of power. No dreary, long-faced minister could have channeled God's healing to my baby, and it was the joy on the minister's face that called forth my faith. Looking on him I knew that he had been with the One who came to give us His joy, and so I knew that the baby would be well. The minister placed his hands upon the baby's ears and said, "Now you close your eyes and go to sleep. I'm going to ask God to come into your ears and make them well, and when you wake up you'll be all right." He did ask God exactly that, in the simplest possible way. He closed his prayer by saying, "We thank you, Heavenly Father, because we know that this is being done. Amen." The fever-flush died out of the baby's face immediately. He turned very pale, closed his eyes and slept. When he woke, he was well. And he never again has had abscessed ears. This incident turned on the light for me in the world that had grown very dark with futility. It showed me that God is an active and powerful reality. True, I understood very little about Him. I merely thought that the visiting minister had the gift of healing. Now I know that he had no gift except that which is open to all of us, the infinite gift of the life of God Himself. God's water of life could rush through him, for the pipeline between his spirit and God's spirit was intact. He was in harmony with God. The life of God flowed through him, and could therefore be turned on by him for the healing of a child. He knew it, and therefore had the courage to speak with authority. "We thank you because we know that this is being done," he had said, adding the word, "Amen (So be it)," a word of command. All prayers end with "Amen," but usually the word is meaningless. The people who utter it do not in the least intend to send forth a command so positive that they would dare to say, "When he wakes he will be all right." This is one reason many prayers do not seem to be answered. "The kingdom of God is within you," said Jesus. And it is the indwelling light, the secret place of the consciousness of the Most High that is the kingdom of Heaven in its present manifestation on this earth. Learning to live in the kingdom of Heaven is learning to turn on the light of God within. We must learn that God is not an unreasonable and impulsive sovereign who breaks His own laws at win. As soon as we learn that God does things through us (not for us), the matter becomes as simple as breathing, as inevitable as sunrise. "But God is omnipotent!" some people say. "He can do anything He likes! " Certainly, but He has made a world that runs by law, and He does not like to break those laws. Some day the world will come to understand this fact, as it is now beginning to understand the miracle of light waves, for one generation's miracles are the commonplaces of another generation. Some day we will understand the principles that underlie the miracle-working powers of God, and we will accept His intervention as simply and naturally as we do the radio and television that cause us to see and hear a person far away both in space and in time.